Every so often it’s the idea behind a novel which leads you to pick it up. 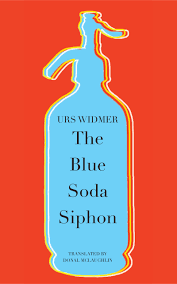 Urs Widmer’s The Blue Soda Siphon is a case in point. Widmer is a Swiss writer who, despite the fact that Seagull books, and Donal McLaughlin, have now translated six of his titles into English, I had never heard of before (though it has to be said that I came across him while exploring their back catalogue). Yet as soon as I read the conceit behind this particular novel I wanted to read it. The premise was simple but intriguing: the narrator finds himself inexplicably returned to the time of his childhood, while his childhood self is transported to the present. Instinctively he boards a train for his home town, and only after encountering his father among a group of soldiers (it’s his bicycle he recognises) does he realise what has happened. He makes his way to his old house, encountering numerous amusing ironies. “Does the dog know you?” his mother asks, and when he tells his father he’s his son, his father replies, “Listen, any other time, yes. But I’m not in the mood for jokes today.” Only later do they discover their ‘real’ son is missing. What prevents this being a literary Back to the Future is that there seems little danger of either narrator altering the other’s timeline. Nor is there much tension regarding returning to the correct time – it is assumed by the older man that all he need do is go back to the cinema, where his younger version also disappeared. Only after they have returned do we discover that child’s adventures in his future. Widmer also takes time to recount the stories of the films his narrators watch, containing strange echoes of their own story. Recognising the fragility of his experience has heightened it. The Blue Soda Siphon was as fascinating as I had hoped it would be. My late discovery of Widmer at least means that another five titles are already waiting. You are currently browsing the archives for the Urs Widmer category.